Projector Online is a software that turns your ordinary projector into a wireless projector. After installing and running it on the computer connected to a projector (hereinafter called 'Server'), any user can transfer their desktop screen to the projector in real time with lossless quality via network, no VGA cable switching is needed any more!It can runs smoothly on any local network including wireless connection (802.11b/g, 11Mbps). ...... 11b/g, 11Mbps). The 130K only 'green' client supports all Windows systems and needs no installation. If you are planning to buy a new wireless projector to replace the old one, why not try Projector Online? * Compatible with all projectors. The final decompressed image is nearly lossless as compared with the original. This is very important when you are demonstrating photos. The client supports up to 30 frames depending on processor speed . Based on SSCV2, the maximal band-width used is less than 5Mbps. In most cases, the average band-width used is only 500Kbps. 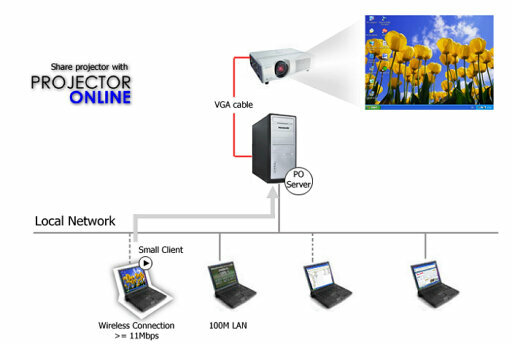 So, Projector Online supports any local area network connection (10Mbps or more), including wireless connection. (802.11b, 802.11g). and even VPN or internet. Versatile solution for managing online events. Qweas is providing links to Projector Online 2.0 as a courtesy, and makes no representations regarding Projector Online or any other applications or any information related thereto. Any questions, complaints or claims regarding this application Projector Online 2.0 must be directed to the appropriate software vendor. You may click the publisher link of Projector Online on the top of this page to get more details about the vendor.